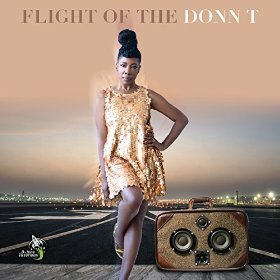 Flight of the Donn T, the second full-length release from Philly-based singer/songwriter, Donn T (but this time on her own label, D-tone Victorious) is a malleable mix of a more pop side of soul, an authentic push of contemplatively, emotional R&B, but still exudes much, much more. In her world, romanticism takes on a techno-house feel (harkening back to the gloriousness of her first album, Kaleidoscopic), while other tracks are firmly rooted in R&B, but possess a futuristic vibe. Donn T’s lyricism moves between a straightforward cohesion, but at times the realism twists into heady, witty and unforgettable prose. Electric guitar abounds heavily and impressively on the album at the hands of Jake Morelli who has played with Ed Sheeran, Bruno Mars and Ne-Yo, to name a very few). Donn T’s sibling, Questlove, of the legendary group, The Roots, has a presence on the album, also. The breezy, acoustic love sway of “What’s Beautiful” shows off Donn T’s classically stunning vocals, which also act as an unshakable strength the album revolves around. “Waiting” is slow elegance, torrid yet satiating and can be heard in the Ava DuVernay film, I Will Follow. “Midnight” featured on the Lifetime movie, With This Ring, erupts into a plethora of strings and possesses a slight rock, bold, vintage, R&B push, while “Last Breath” and its flickers of percussion and soulful piano creates a brilliant hypnotism that breaks down into a glorious dawn. Flight of the Donn T is full of creative brawn, remains preciously artful and plays within an array of emotions and what you then have is a journey worth taking over and over again.